1. Preheat oven to 325 degrees and grease a 10 inch springform pan. 2. CRUST: combine melted butter, graham cracker crumbs, sugar and salt. Dump into prepared pan and firmly press into the bottom of the pan and halfway up the sides. Try to make the crust evenly thick everywhere. 3. Bake for 15-20 minutes or until it's golden brown. Let cool completely and then wrap the sides with aluminum foil and set in roasting pan. 4. Bring a large pot of water to boil on the stove top, you'll use this was a water bath later. 5. FILLING: Beat cream cheese and sugar until smooth. Don't try to rush this step, you don't want lumps in your cake! Scrape down the sides of the bowl as needed. 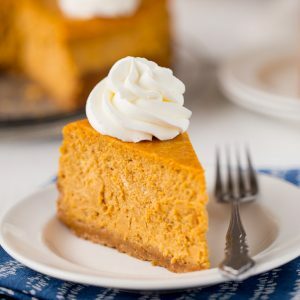 On low speed, add sour cream and pumpkin an mix again. Then add one egg at a time until incorporated. Keep the mixer on low this whole time because you don't want to whip any air into the batter! Add vanilla and all the spices. Once combined, pour into cooled crust. Place the roasting pan (which should have your springform pan in it) into the oven on the middle rack and then pour in your boiling water to the roasting pan until the water reaches halfway up sides of the springform pan. Bake for 1 hour and 45 minutes, the edges should be set but the middle will still be loose. Open the oven door to let out some heat and then turn off the oven and leave the pie in for 1 more hour. 7. Remove from springform pan and serve with whipped cream!